Location: Kos Greece.The Ikos Aria is approximately 20 minutes drive from the airport. Description: These ultra-spacious and elegant bungalow-style suites (58 Sq Mtrs) come with a separate bedroom and lounge for extra privacy. Panoramic windows and a private garden offer views over the beautiful Aegean. The perfect space for two adults and three children.Ikos Aria is located on the southwest coast of Kos, one of the larger islands in the Dodecanese, a little to the north of Rhodes. The resort is 20 minutes drive from the airport and 45 minutes from the lively town of Kos. With the island steeped in history, the Aria is an ideal base from which to explore its archaeological wealth, as well as the surrounding countryside with all it has to offer. Spread over 47 acres, the Hotel is an elegant collection of 402 suites and rooms offering a choice of private balconies, gardens and individual pools. Eight delightful restaurants offer a remarkable culinary experience to tempt guests with a world of flavour stretching from the Mediterranean to the Orient. Michelin-starred menus take centre stage and the innovative dine-out programme introduces you to some of the best local restaurants. Occupancy: The price shown here is based on 2 Adults plus 2 Children 11yrs and under sharing a 1 Bed Suite Private Garden Sea View on an All Inclusive basis. Occupancy: The price shown here is based on 2 Adults plus 3 Children 11yrs and under sharing a 1 Bed Suite Private Garden Sea View on an All Inclusive basis. Occupancy: The price shown here is based on 3 Adults plus 1 child aged 11yrs and under sharing a 1 Bed Suite Private Garden Sea View on an All Inclusive basis. Occupancy: The price shown here is based on 3 Adults plus 2 Children 11yrs and under sharing a 1 Bed Suite Private Garden Sea View on an All Inclusive basis. Description: These ultra-spacious and elegant family-style suites (50 Sq Mtrs) come with a separate bedroom and lounge for extra privacy. The panoramic windows and private balcony offer relaxing views over the beautiful Aegean. The perfect space for two adults and three children. Ikos Aria is located on the southwest coast of Kos, one of the larger islands in the Dodecanese, a little to the north of Rhodes. The resort is 20 minutes drive from the airport and 45 minutes from the lively town of Kos. With the island steeped in history, the Aria is an ideal base from which to explore its archaeological wealth, as well as the surrounding countryside with all it has to offer. Spread over 47 acres, the Hotel is an elegant collection of 402 suites and rooms offering a choice of private balconies, gardens and individual pools. Eight delightful restaurants offer a remarkable culinary experience to tempt guests with a world of flavour stretching from the Mediterranean to the Orient. Michelin-starred menus take centre stage and the innovative dine-out programme introduces you to some of the best local restaurants. Occupancy: The price shown here is based on 2 Adults plus 2 Children 11yrs and under sharing a 1 Bed Suite Sea View on an All Inclusive basis. Description: These ultra-spacious and elegant family-style suites (50 Sq Mtrs) come with a separate bedroom and lounge for extra privacy. The panoramic windows and private balcony offer relaxing views over the beautiful Aegean. The perfect space for two adults and three children.Ikos Aria is located on the southwest coast of Kos, one of the larger islands in the Dodecanese, a little to the north of Rhodes. The resort is 20 minutes drive from the airport and 45 minutes from the lively town of Kos. With the island steeped in history, the Aria is an ideal base from which to explore its archaeological wealth, as well as the surrounding countryside with all it has to offer. Spread over 47 acres, the Hotel is an elegant collection of 402 suites and rooms offering a choice of private balconies, gardens and individual pools. Eight delightful restaurants offer a remarkable culinary experience to tempt guests with a world of flavour stretching from the Mediterranean to the Orient. Michelin-starred menus take centre stage and the innovative dine-out programme introduces you to some of the best local restaurants. Occupancy: The price shown here is based on 2 Adults plus 3 Children 11yrs and under sharing a 1 Bed Suite Sea View on an All Inclusive basis. Occupancy: The price shown here is based on 3 Adults plus 1 Child 11yrs and under sharing a 1 Bed Suite Sea View on an All Inclusive basis. Occupancy: The price shown here is based on 3 Adults plus 2 Children 11yrs and under sharing a 1 Bed Suite Sea View on an All Inclusive basis. Description: Set in an exclusive beachfront location with a furnished private garden these ultra-spacious suites feature two separate bedrooms and a lounge for a high level of privacy. (90Sq Mtrs). These privileged suites comfortably accommodate up to six. Panoramic windows offer relaxing sea views whilst the suite’s fully furnished balcony offers ample room for sunbathing and al fresco relaxation. Ikos Aria is located on the southwest coast of Kos, one of the larger islands in the Dodecanese, a little to the north of Rhodes. The resort is 20 minutes drive from the airport and 45 minutes from the lively town of Kos. With the island steeped in history, the Aria is an ideal base from which to explore its archaeological wealth, as well as the surrounding countryside with all it has to offer. Spread over 47 acres, the Hotel is an elegant collection of 402 suites and rooms offering a choice of private balconies, gardens and individual pools. Eight delightful restaurants offer a remarkable culinary experience to tempt guests with a world of flavour stretching from the Mediterranean to the Orient. Michelin-starred menus take centre stage and the innovative dine-out programme introduces you to some of the best local restaurants. Occupancy: The price shown here is based on 2 Adults plus 2 Children 11yrs and under sharing a DELUXE 1 Bed Bungalow Suite Beachfront on an All Inclusive basis. Occupancy: The price shown here is based on 3 Adults plus 2 Children 11yrs and under sharing a DELUXE 1 Bed Bungalow Suite Beachfront on an All Inclusive basis. Description: These luxurious, spacious family suites (77 Sq Mts) offer a separate bedroom and lounge for extra privacy. Panoramic windows offer relaxing sea views whilst the suite’s fully furnished balcony offers ample room for sunbathing and al fresco relaxation. Ikos Aria is located on the southwest coast of Kos, one of the larger islands in the Dodecanese, a little to the north of Rhodes. The resort is 20 minutes drive from the airport and 45 minutes from the lively town of Kos. With the island steeped in history, the Aria is an ideal base from which to explore its archaeological wealth, as well as the surrounding countryside with all it has to offer. Spread over 47 acres, the Hotel is an elegant collection of 402 suites and rooms offering a choice of private balconies, gardens and individual pools. Eight delightful restaurants offer a remarkable culinary experience to tempt guests with a world of flavour stretching from the Mediterranean to the Orient. Michelin-starred menus take centre stage and the innovative dine-out programme introduces you to some of the best local restaurants. Occupancy: The price shown here is based on 2 Adults plus 2 Children 11yrs and under sharing a DELUXE 1 Bed Bungalow Suite Sea View on an All Inclusive basis. Occupancy: The price shown here is based on 3 Adults plus 1 child under 12 yrs sharing a DELUXE 1 Bed Bungalow Suite Sea View on an All Inclusive basis. Occupancy: The price shown here is based on 3 Adults plus 2 Children 11yrs and under sharing a DELUXE 1 Bed Bungalow Suite Sea View on an All Inclusive basis.. Description: These luxurious, spacious suites (77 Sq Mts) offer a separate bedroom and lounge for extra privacy.With an impressive private pool and fabulous location, these elegant and luxuriously spacious suites offer spectacular views. With a separate bedroom and lounge for extra privacy and a spacious sun terrace furnished with sun loungers. Ikos Aria is located on the southwest coast of Kos, one of the larger islands in the Dodecanese, a little to the north of Rhodes. The resort is 20 minutes drive from the airport and 45 minutes from the lively town of Kos. With the island steeped in history, the Aria is an ideal base from which to explore its archaeological wealth, as well as the surrounding countryside with all it has to offer. Spread over 47 acres, the Hotel is an elegant collection of 402 suites and rooms offering a choice of private balconies, gardens and individual pools. Eight delightful restaurants offer a remarkable culinary experience to tempt guests with a world of flavour stretching from the Mediterranean to the Orient. Michelin-starred menus take centre stage and the innovative dine-out programme introduces you to some of the best local restaurants. Occupancy: The price shown here is based on 3 Adults plus 2 Children 11yrs and under sharing a DELUXE 1 Bed Bungalow Private Pool Sea View on an All Inclusive basis.. Occupancy: The price shown here is based on 2 Adults plus 2 Children 11yrs and under sharing a DELUXE 1 Bed Bungalow Private Pool Sea View on an All Inclusive basis.. Occupancy: The price shown here is based on 3 Adults plus 1 Child 11yrs and under sharing a DELUXE 1 Bed Bungalow Private Pool Sea View on an All Inclusive basis.. Occupancy: The price shown here is based on 2 Adults plus 4 Children 11yrs and under sharing a DELUXE 2 Bed Bungalow Suite Beachfront on an All Inclusive basis. Occupancy: The price shown here is based on 3 Adults and one child under 12 yrs sharing a DELUXE 2 Bed Bungalow Suite Beachfront on an All Inclusive basis. Occupancy: The price shown here is based on 4 adults and 1 child (11yrs and under) sharing a Deluxe 2 Bed Bungalow Suite Beachfront on an All Inclusive basis. Description: Set in an exclusive location, with an impressive private pool, these luxurious, ultra-spacious family suites offer extensive views over the Aegean. Each suite features two separate bedrooms and a lounge for a high degree of privacy. (107 Sq Mts). Panoramic windows offer relaxing sea views whilst the suite’s fully furnished balcony offers ample room for sunbathing and al fresco relaxation. Ikos Aria is located on the southwest coast of Kos, one of the larger islands in the Dodecanese, a little to the north of Rhodes. The resort is 20 minutes drive from the airport and 45 minutes from the lively town of Kos. With the island steeped in history, the Aria is an ideal base from which to explore its archaeological wealth, as well as the surrounding countryside with all it has to offer. Spread over 47 acres, the Hotel is an elegant collection of 402 suites and rooms offering a choice of private balconies, gardens and individual pools. Eight delightful restaurants offer a remarkable culinary experience to tempt guests with a world of flavour stretching from the Mediterranean to the Orient. Michelin-starred menus take centre stage and the innovative dine-out programme introduces you to some of the best local restaurants. Occupancy: The price shown here is based on 4 Adults plus 2 Children 11yrs and under sharing a DELUXE 2 Bed Bungalow Suite Private Pool Sea View on an All Inclusive basis. Description: Seamless indoor-outdoor living comes to life in these spacious suites (50 Sq Mtrs) with private garden. Perfect for two adults and two children, each suite combines bedroom and living room in one contemporary open plan design, complete with sofa bed and dining area. Offering gorgeous pool or sea views.Ikos Aria is located on the southwest coast of Kos, one of the larger islands in the Dodecanese, a little to the north of Rhodes. The resort is 20 minutes drive from the airport and 45 minutes from the lively town of Kos. With the island steeped in history, the Aria is an ideal base from which to explore its archaeological wealth, as well as the surrounding countryside with all it has to offer. Spread over 47 acres, the Hotel is an elegant collection of 402 suites and rooms offering a choice of private balconies, gardens and individual pools. Eight delightful restaurants offer a remarkable culinary experience to tempt guests with a world of flavour stretching from the Mediterranean to the Orient. Michelin-starred menus take centre stage and the innovative dine-out programme introduces you to some of the best local restaurants. Occupancy: The price shown here is based on 2 Adults (and one child under 12 yrs if required) sharing a DELUXE JUNIOR SUITE Private Garden Sea View on an All Inclusive basis. Occupancy: The price shown here is based on 2 Adults and 2 Children 11yrs and under sharing a DELUXE JUNIOR SUITE Private Garden Sea View on an All Inclusive basis. Description: Beautifully spacious and furnished in contemporary Mediterranean style, these elegant suites (40 Sq Mtrs) provide perfectly for two adults and two children. The panoramic windows and fully furnished balconies offer views over the dazzling Aegean Sea.Ikos Aria is located on the southwest coast of Kos, one of the larger islands in the Dodecanese, a little to the north of Rhodes. The resort is 20 minutes drive from the airport and 45 minutes from the lively town of Kos. With the island steeped in history, the Aria is an ideal base from which to explore its archaeological wealth, as well as the surrounding countryside with all it has to offer. Spread over 47 acres, the Hotel is an elegant collection of 402 suites and rooms offering a choice of private balconies, gardens and individual pools. Eight delightful restaurants offer a remarkable culinary experience to tempt guests with a world of flavour stretching from the Mediterranean to the Orient. Michelin-starred menus take centre stage and the innovative dine-out programme introduces you to some of the best local restaurants. Occupancy: The price shown here is based on 2 Adults plus 2 Children 11yrs and under sharing a Junior Suite Balcony Sea View on an All Inclusive basis. Occupancy: The price shown here is based on 2 Adults (plus one child under 12 yrs if required) sharing a Junior Suite Balcony Sea View on an All Inclusive basis. Occupancy: The price shown here is based on 3 Adults sharing a Junior Suite Balcony Sea View on an All Inclusive basis. Description: Beautifully spacious and furnished in contemporary Mediterranean style, these elegant suites (45 Sq Mtrs) provide perfectly for two adults and two children. The panoramic windows and fully furnished private garden offer views over the dazzling Aegean Sea or the verdant gardens.Ikos Aria is located on the southwest coast of Kos, one of the larger islands in the Dodecanese, a little to the north of Rhodes. The resort is 20 minutes drive from the airport and 45 minutes from the lively town of Kos. With the island steeped in history, the Aria is an ideal base from which to explore its archaeological wealth, as well as the surrounding countryside with all it has to offer. Spread over 47 acres, the Hotel is an elegant collection of 402 suites and rooms offering a choice of private balconies, gardens and individual pools. Eight delightful restaurants offer a remarkable culinary experience to tempt guests with a world of flavour stretching from the Mediterranean to the Orient. Michelin-starred menus take centre stage and the innovative dine-out programme introduces you to some of the best local restaurants. Occupancy: The price shown here is based on 2 Adults plus 2 Children 11yrs and under sharing a Junior Suite Private Garden garden view on an All Inclusive basis. Occupancy: The price shown here is based on 3 Adults plus 1 Child 11yrs and under sharing a Junior Suite Private Garden garden view on an All Inclusive basis. Description: Spacious, elegant, contemporary-style rooms (31 Sq Mtrs) in the main building. Panoramic windows and a furnished private balcony deliver stunning views of the beach and Aegean Sea, or overlook the beautifully landscaped gardens.Ikos Aria is located on the southwest coast of Kos, one of the larger islands in the Dodecanese, a little to the north of Rhodes. The resort is 20 minutes drive from the airport and 45 minutes from the lively town of Kos. With the island steeped in history, the Aria is an ideal base from which to explore its archaeological wealth, as well as the surrounding countryside with all it has to offer. Spread over 47 acres, the Hotel is an elegant collection of 402 suites and rooms offering a choice of private balconies, gardens and individual pools. Eight delightful restaurants offer a remarkable culinary experience to tempt guests with a world of flavour stretching from the Mediterranean to the Orient. Michelin-starred menus take centre stage and the innovative dine-out programme introduces you to some of the best local restaurants. Occupancy: The price shown here is based on 2 Adults sharing a Promotional Double Room Inland View on an All Inclusive basis. This room may accommodate a maximum of 2 Adults. Occupancy: The price shown here is based on 2 Adults sharing a Promotional Double Room Sea View on an All Inclusive basis. This room may accommodate a maximum of 2 Adults. 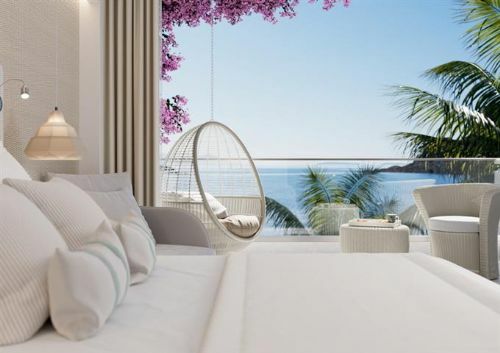 Description: The elegant interior of these spacious Superior Triple Sea View rooms (31 Sq Mtrs) are perfectly complimented by side sea views on top of the landscaped gardens or relaxing views of the Aegean. Feature windows and a furnished private balcony provide guests with seamless indoor-outdoor living in the main building.Ikos Aria is located on the southwest coast of Kos, one of the larger islands in the Dodecanese, a little to the north of Rhodes. The resort is 20 minutes drive from the airport and 45 minutes from the lively town of Kos. With the island steeped in history, the Aria is an ideal base from which to explore its archaeological wealth, as well as the surrounding countryside with all it has to offer. Spread over 47 acres, the Hotel is an elegant collection of 402 suites and rooms offering a choice of private balconies, gardens and individual pools. Eight delightful restaurants offer a remarkable culinary experience to tempt guests with a world of flavour stretching from the Mediterranean to the Orient. Michelin-starred menus take centre stage and the innovative dine-out programme introduces you to some of the best local restaurants. Occupancy: The price shown here is based on 2 Adults plus 1 Child 11yrs and under sharing a Superior Triple Room Sea View on an All Inclusive basis. Description:The elegant interior of these spacious Superior Triple Side Sea View rooms (31 Sq Mtrs) are perfectly complimented by side sea views on top of the landscaped gardens or relaxing views of the Aegean. Feature windows and a furnished private balcony provide guests with seamless indoor-outdoor living in the main building. Ikos Aria is located on the southwest coast of Kos, one of the larger islands in the Dodecanese, a little to the north of Rhodes. The resort is 20 minutes drive from the airport and 45 minutes from the lively town of Kos. With the island steeped in history, the Aria is an ideal base from which to explore its archaeological wealth, as well as the surrounding countryside with all it has to offer. Spread over 47 acres, the Hotel is an elegant collection of 402 suites and rooms offering a choice of private balconies, gardens and individual pools. Eight delightful restaurants offer a remarkable culinary experience to tempt guests with a world of flavour stretching from the Mediterranean to the Orient. Michelin-starred menus take centre stage and the innovative dine-out programme introduces you to some of the best local restaurants. Occupancy: The price shown here is based on 3 Adults sharing a Superior Triple Room with a Side Sea View on an All Inclusive basis.